Just minutes before anti-riot police charged opposition marchers in Tehran last week, a new chant bubbled up from the crowd: "Death to Nobody." It was more than just a play on the "Death to America" slogans that are staples of Iran's political life. The cries give a sense of how much the protest movement has evolved since the raw outrage of last summer. The demonstrations have moved beyond narrow attacks on President Mahmoud Ahmadinejad and his disputed re-election in June. They are now drifting toward a blanket challenge of the Islamic leadership's right to rule. "It's gone from anti-Ahmadinejad to more of anti-regime in general," said Mustafa Alani, a regional analyst at the Gulf Research Center in Dubai. "That's an important shift." And here lies the protesters' strength, but also their potential unraveling, some experts say. An overall challenge to the powers of non-elected clerics - headed by Supreme Leader Ayatollah Ali Khamenei - could provide the big picture goal to sustain the demonstrations for years. But it also carries risks. Top among them: alienating the opposition leadership, who remain still loyal to the Islamic system, and bringing even harsher crackdowns by authorities who can justify use of violence to protect the status quo. The two senior figures in the opposition, Mir Hossein Mousavi and Mahdi Karroubi, have repeatedly said they do not seek to overthrow the ruling clerics. Since July, authorities have put on trial more than 100 pro-reform figures accused of being part of a plot to topple this religious hierarchy. Mousavi and Karroubi's reluctance could leave room for more militant opposition leaders to emerge in the future. The protests last week coincided with state-run rallies marking the 30th anniversary of the takeover of the U.S. Embassy in Tehran. The timing, like the shouts of "Death to Nobody," were a symbolic challenge to one of the ideological pillars of the regime - the anti-U.S. fervor of the 1979 Islamic Revolution that toppled the pro-American shah. Just blocks away from the opposition marches, the pro-government demonstrators were bellowing the standard beat of "Death to America" to mark the Nov. 4 embassy seizure. Many pro-reform marchers still wore the green colors of Mousavi, who claims he is the rightful winner of the June 12 presidential election. But much of the protesters' defiance went beyond Mousavi's complaints over the election and the subsequent crackdown and targeted Khamenei in acts that were almost unthinkable before the postelection meltdown. Protesters tore up or trampled images of the supreme leader, whose most ardent backers believe is answerable only to God. Demonstrators also called on President Barack Obama to pick a side, in apparent frustration with White House efforts for direct talks with Iran's leaders. "Obama, Obama, you are either with them, or with us," they chanted. The opposition leaders were not among the crowd. Reformist web sites say hard-line vigilantes kept Mousavi from leaving his office. Karroubi was overcome by tear gas and left before riot police moved in, according to his Web site. More than 100 people were detained, including several journalists, but most were later released. 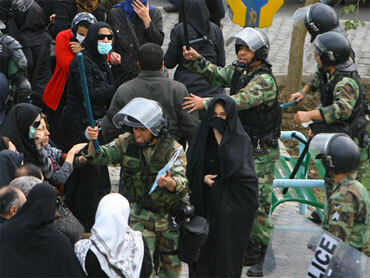 Karroubi later denounced the "very ugly" tactics of police, which he claimed included attacking women. Mousavi issued a statement calling for the rights of all Iranians to be respected. But there was nothing to suggest they would follow the protesters' lead in hardening their stance against Iran's political system. After security forces crushed that massive protests that erupted after the election, opposition groups in recent months have used major state-backed events to stage rival rallies. The next test could come Dec. 7, which marks the death of three students in 1953 during protests of a visit by then-Vice President Richard Nixon for talks with the shah. Reform groups appear focused on trying to build a credible turnout for the next marches after just several thousand joined last week's protests. Some reformist Web sites have urged students to stay off campus on the days of future marches so they can't be blocked from joining by security forces. Many other sites are carrying one of the new symbols of the opposition: a green-hued drawing of a young woman wearing a headscarf and thrusting up her fist in protest. "The long-term crisis for the government isn't over," said Alireza Nader, an analyst of Iranian affairs at the RAND Corp. in Washington. Still, authorities must be careful about how hard they push back or else they risk a backlash. The government crackdown so far "has been very violent but measured in some ways," Nader said. But if authorities carry out threats to arrest Mousavi and Karroubi, "this could fan the flames," he said. Some high-level officials have offered talks with the opposition as a way to keep the tensions from spilling over to recurring cycles of protests and violence. The former chief of the judiciary and close ally of Khamenei, Ayatollah Mahmoud Shahroudi, was quoted Monday in Iranian newspapers as calling the postelection rifts a "family dispute" that can be worked out through dialogue. But Meir Javedanfar, an Iran analyst based in Israel, said Khamenei "sees the reformist movement as a threat" and aims to "stifle its growth and, if he can, to completely suffocate them." But the greater the pressure, the more risk he could rally people around the protests. "Khamenei's actions could actually strengthen the reformist movement," he said.